This is one of my newer pairs. It has just a little bit of a cropped length to them, and they're a lighter wash. I loved these because the ankle length looks amazing with heeled sandals. 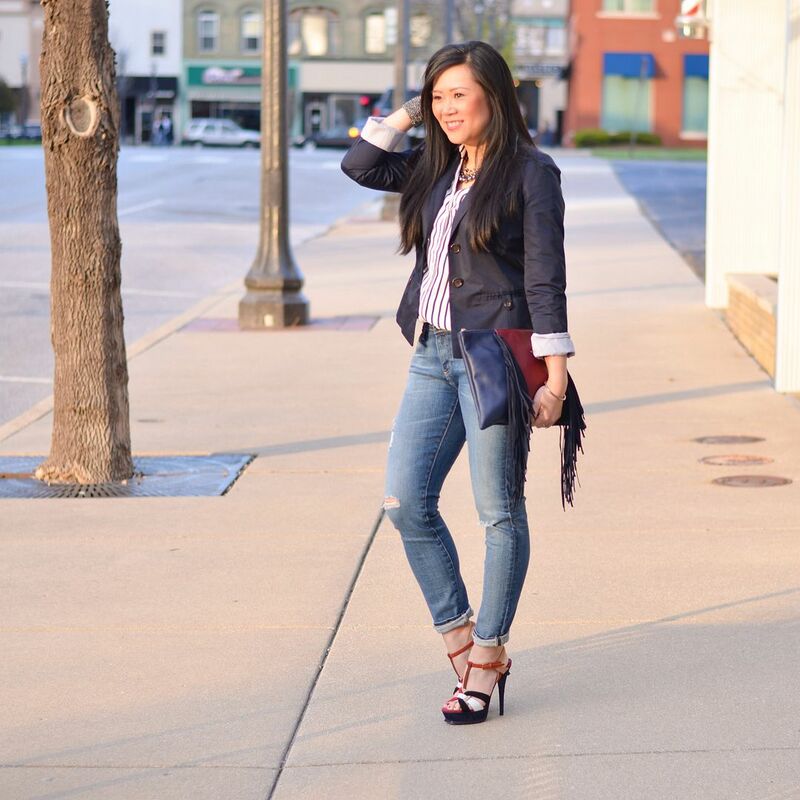 This was a date night look, so I threw on the blazer to dress it up just a little! There are only hints of distressing in this pair, so it's nice when I don't want to be obnoxious with all the rips. This pair is also a bit cropped and a lighter wash, but it has a lot more distressing. This is totally a weekend casual look with wedge sandals and a simple tee. This is the lightest wash of destroyed denim I own. They're pretty significantly distressed, especially around the knees. The lighter wash always makes me feel more 80's or 90's as do white pumps, which is why I paired these two together. 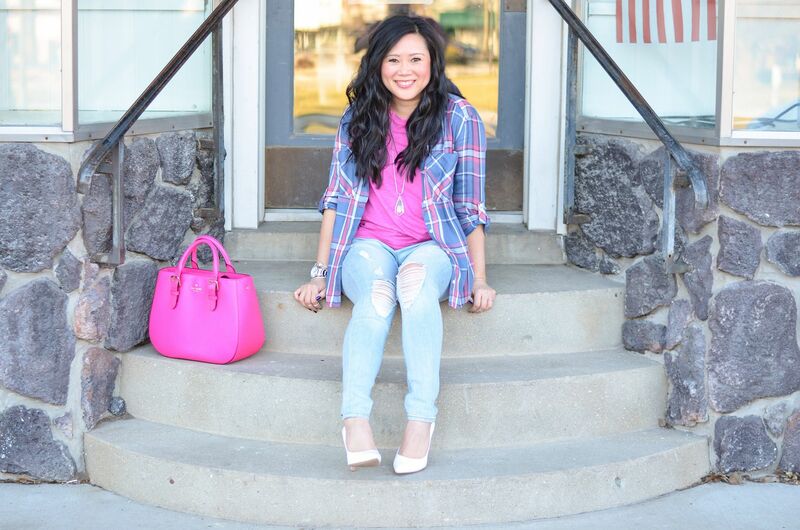 Plus, the heels make the plaid and tee less grunge feeling and a little more playful and feminine. It is amazing what strong accessories can do to a pair of destroyed jeans. I wore this for a semi-casual New Year's Eve dinner, but I chose a statement necklace along with a metallic bag and heels to take this tee shirt from casual and relaxed to more of a night out look. 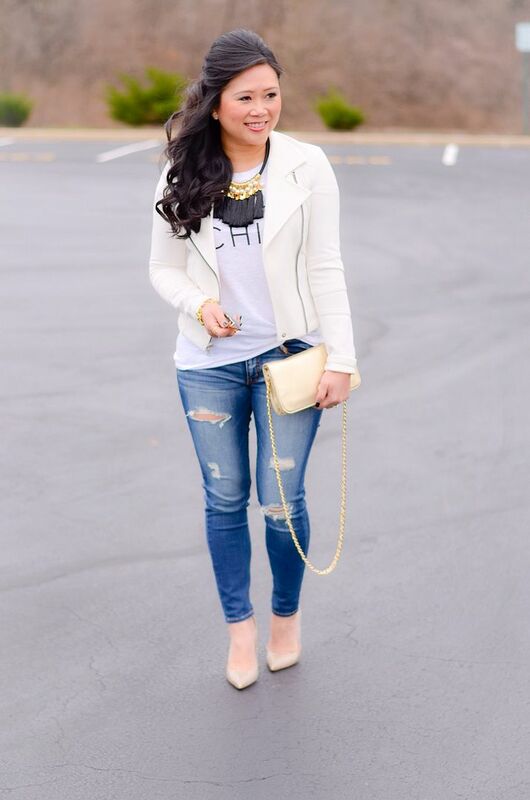 This look is the perfect transition outfit. A springier plaid, a pop of color with the sandals, and more subtle distressing so your legs aren't freezing in the cooler spring air. I tend to cuff my skinnies when I wear them with sandals. I'm not sure why, but the proportions just feel more warm-weathery to me that way. I am really surprised how much I love this pair of jeans. It has the most distressing of any of the pairs I own, and they're not super skinny fitting. They have a touch of a relaxed fit to them and because of that, I wanted to make sure I played up the feminine attitude with the rest of the pieces - strong jewelry, colorblock clutch, floral heels, gosh this is such a favorite outfit of mine! As you can see, I favor pointy toe heels the most when wearing them. The heels make the distressing feel more edgy vs. sloppy. At least that's my reasoning! But the whole feel of this look changes if I were to ditch the heels for some Converse, which isn't a bad thing, it just all depends on what look you are going for! When you've conquered the world of destroyed denim and you feel like you just can't manage to buy another pair, then you can start to dabble with other colors! I now have destroyed skinnies in this blush color above, mint, black, and also red. The possibilities are endless! Hope you enjoyed this little roundup! Have a great weekend! Destroyed denim looks so gorgeous on you. All looks are so cute. you do destroyed denim so well, great post. OMG your collection of jeans is amazing. You have so many distressed pairs and each is lovely. I adore the dusty rose pair. And the outfit with the red plaid shirt is the cutest. Hope all is well Carylee. Welcome by and linkup with me. I would love for you to linkup today. Thanks and have a great weekend! I have the same problem, tons and tons of jeans and even more that are distressed! Oh well! All are fabulous! And every pair of jeans has their own special place in your closet. I know because at my last count I had 44 pairs of jeans (that did include white and colored denim). But it did not include the bin of jeans that I have stored in the garage are too big but I am afraid to dispose of yet! I love the look of destroyed denim, but for some reason I can't let myself buy a pair since I cannot wear them to work. I know that is crazy, but I just feel like I will not wear them that often...but I still want a pair! They all look great on you!